Choose First Parish Church for your next ceremony or special event. 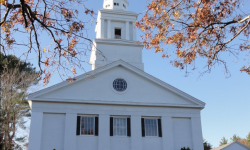 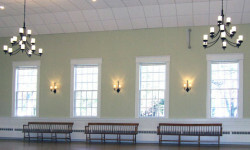 Our historic New England meetinghouse, built in 1840, is beautiful and spacious, seating up to 400 comfortably. 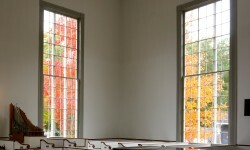 The classic, Greek Revival interior is striking in daylight, when the soaring windows provide views of trees and sky, or in the evening, especially when lit by candles. 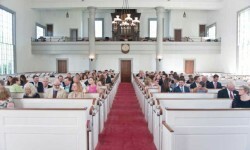 The large, open sanctuary features a long center aisle. 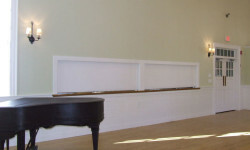 Organ and piano are available. 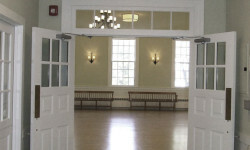 The Harvey Assembly Hall, in the connected Parish House, is available to rent for receptions or other public events, with access to the commercial-grade kitchen. 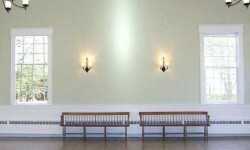 The hall and parlor can be set up for a reception to accommodate up to 300 standing guests, 285 seated guests (chairs only), and up to 125 dining guests (tables and chairs). 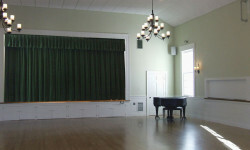 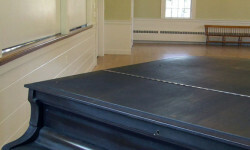 The hall features sage green walls, crisp white trim, black wrought-iron chandeliers and sconces, a grand piano, coat closet, music system, and a stage with professional lighting. 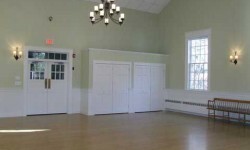 Available for intimate weddings, child dedications and similar events. 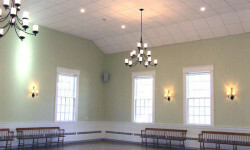 The chapel opens directly onto the brick-paved Memorial Garden, making outdoor receptions possible in pleasant weather. 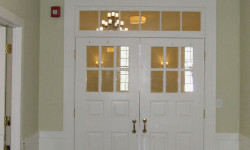 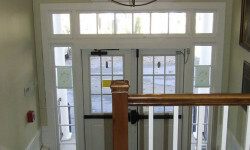 Consult our building use policies for detailed pricing and information.